A newspaper article published by The Central Florida Press on June 20, 1930. The article describes a "freak happening" in which a quail hatched a hen egg in Oviedo, Florida. The quail was owned by Max Leinhart, who appeared on the radio program Ripley's Believe It or Not!. The radio show premiered on April 14, 1930 and was hosted by its founder, Robert Ripley, and ran until 1948, when Ripley began to convert the show to a television program. Original newspaper article: "Believe It or Not—Quail Hatches Out Hen Egg in Oviedo." The Central Florida Press, Vol. 1, No. 9, June 20, 1930, page 1: Oviedo Historical Society, Oviedo, Florida. 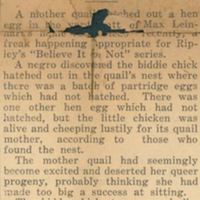 Digital reproduction of original newspaper article: "Believe It or Not—Quail Hatches Out Hen Egg in Oviedo." The Central Florida Press, Vol. 1, No. 9, June 20, 1930, page 1. "THE ICONIC MR. RIPLEY." Ripley's Believe It or Not! http://www.ripleys.com/our-story/robert-ripley/. “Believe It or Not—Quail Hatches Out Hen Egg in Oviedo.” RICHES of Central Florida accessed April 24, 2019, https://richesmi.cah.ucf.edu/omeka/items/show/5682.